Is a uniquely buffered calcium chloride solution for foliar application for the control of storage disorders in all fruit crops, particularly bitter pit control on pome fruits (apples and pears). 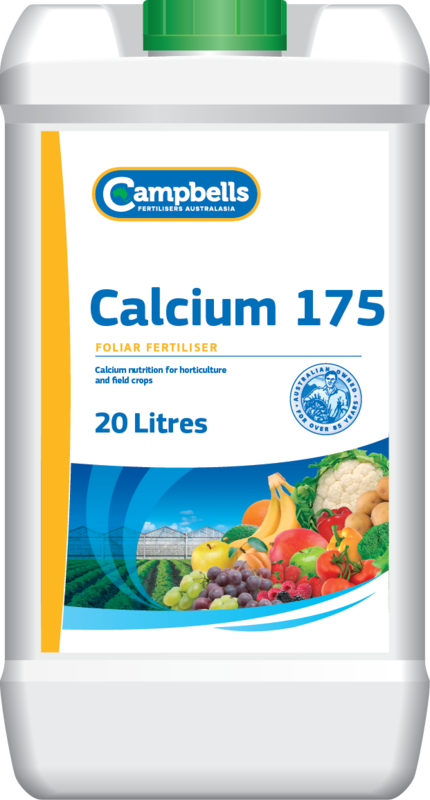 Campbells Calcium-175 is used as a supplementary foliar spray for fruit and vegetables that suffer, or have the potential to suffer, from calcium deficiencies. It’s use on pip fruit is particularly important for export fruit since the potential for apples to develop storage problems such as bitter pit are very high in many varieties. Campbells Calcium-175 is used in apples early to mid season, beginning about 7 days after petal fall, as part of a season long calcium program and then to finish the season before harvest. The addition of trace amounts of boron has been shown to improve calcium uptake. The unique buffering systems virtually eliminates any burning effect normally associated with calcium chloride. Campbells Calcium-175 is recommended for foliar application. Rates of application vary between 5-10 L/ha. Specific rates will depend on the crop, stage of crop development and application method. See the Product label for comprehensive information on rates and application methods. Foliar applications should be avoided during extremes of climate and during flowering. Before application seek advice from your Campbells Calcium-175 distributor or your local agronomist.